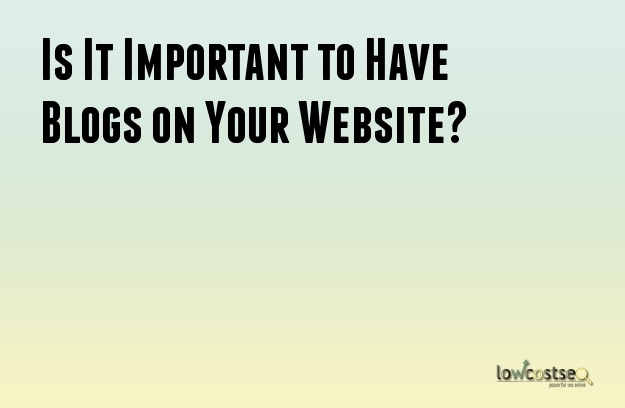 Is It Important to Have Blogs on Your Website? After you have established your complete website with all the basic contents such as the home page, your logo, products and/or services, media, and more, how do you keep it updated? Surely you can add new products and services to your website, but how long does it take you to post a new product or service? The length of time it takes you to post again on your website is also the length of time your website is inactive and outdated. The next thing you should think of is what your website is about. Is it for your business or for your skills? If it is a business, what kind of business do you have? Is it for fashion, food, or what? If it advertises your skills, what kind of skills do you have and what kind of services are you willing to provide? Thinking about those questions, just how well is your site’s focus emphasized on it? Let’s discuss more about how the factors stated above are important to be maintained and looked after, and how blogs can help you boost your web ranking. It is very important that your website stays active and updated because most people prefer going to a website that shows the signs that it is active and ready to take their orders and other needs immediately. This factor is the reason why search engines also try to put up the most recent posts and most active websites on the list. Blogs are one way of solving this problem. Consistently posting blogs will make your website more active and updated. This method will also save you the effort of brainstorming every now and then to formulate new products and services. It also increases the volume of your website from just being a simple one that looks like a catalogue containing just the basics. You can make your blog contents different and unique by adding some instructions, DIYs, informative discussions, video clips, and other media that should be related to the main focus of your website. Let’s have a brainstorming exercise. Let’s say that you have a website for your business and your business is a Spanish deli shop. Think of the products you are selling and the services you provide and what kind of blog topics can you write about them. For example, you can write a blog about variations of chorizos, the proper way of wine tasting, how to make paella, and more. Those topics all circulate within the main idea of your website. You can even add expert opinions or personal blogs to give it a sense of human touch. You can add media such as photos of recipes and video clips on how to do things properly, like in our example earlier, how to taste wine properly. In a slightly more technical way of making your blogs work, focus on tags that are synonymous with your website. Don’t put up too many tags on every blog. You can have a lot of tags in the totality of all your blogs, but never cram them on one blog. You can also emphasize your blog by adding featured snippets which will make your blog more interesting. If you are not confident enough, or you simply just want to make sure that your SEO strategies are efficient, it is best to hire professional help. There are a lot of SEO strategists these days but make sure to consider that the company you will hire will always deliver as promised and that you get what you pay for without actually overpaying. They will help you save time and effort and even resources. Blogs are certainly excellent devices for content marketing and SEO. With a loyal readership, you can improve your business by leaps and bounds. In order to create loyalty amongst your readers and audience, you have to make your blogs credible amongst other things. There are a few ways to garner a loyal readership. You should try and create loyalty amongst your readers. The majority of customers place their trust on the information and advice they gain from credible blogs. At the same time, online companies can get a sizeable number of customers from the readership of their blogs. Even when it comes to making a purchase decision, consumers opt for recommendations from bloggers. In short, consumers believe that blogs can help in forging a good relationship between them and the company. The only way to create a loyal readership is by ensuring that they keep coming back for your blogs. A few tips can help you in the matter. Try to be different when posting information on your blogs. Readers do not like reading information that has been posted before even if you rewrite it. Post something new. Readers prefer a human connection the blogger. That is why they like to read blogs written by individuals rather than companies. Opinion is essential when writing blogs. In some cases, writing from a neutral point is preferable. However, the majority of readers prefer blogs which contain the opinions of the writer. Consistency is of critical importance when posting blogs. If people do not know when your next blog is going to be posted, they can decide to look for other bloggers to get the things they are looking for. People enjoy sharing content that they find interesting or entertaining. Therefore, make it easier for them to share by adding social buttons. Do not forget to add an RSS option as well. Place them at the correct location so that people can access the buttons with ease. Readers can consider your blogs to be authoritative if you seem credible. You can easily demonstrate your credibility through the following ways. You should have a website that looks and feels professional. It will make your blogs look professional as well. Poor designs will simply make your readers feel that you are an amateur and not an expert. The pictures that you are posting in your blogs should be of high quality. They look more professional. Additionally, try to ensure that the images are relevant to the content of the blogs. One of the best ways to ruin your credibility completely is by using bad grammar. Proofread your blogs before posting to minimize and eliminate mistakes. Add a logo that looks attractive. The placement of an attractive logo adds stature to the blog and website. You can add a picture of yourself if you have written the blogs. Ensure that the picture looks professional. Loyal readers are more likely to bring in new readers and consumers to benefit your business or blog.